A root canal, or root canal therapy, is a procedure that cleans out a tooth when the tooth pulp has become infected. Every one of your teeth has a pulp chamber in the center that contains living connective tissues. Nerves travel from the pulp chamber down small passageways in your tooth roots called ‘canals’. When your pulp chamber becomes infected, the infection can affect these nerves, causing a severe, chronic toothache. Root canal therapy removes the infection, alleviates the patient’s toothache, and saves the tooth. 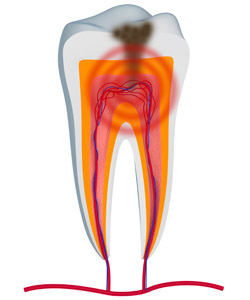 Comfort | Root canals alleviate the chronic toothaches associated with pulp infection. After a root canal, patients will be able to feel comfortable in their day to day lives again. Protection | If an infection is left unchecked, it can spread to other teeth. Root canal therapy protects patients from experiencing more infection and more tooth pain. Root canals also protect the tooth from future damage or decay. Hygiene | Root canals disinfect teeth and clean out the bacteria that can cause dental problems. Smile Security | By performing a root canal, Dr. Mason and his staff can save teeth that would normally need to be extracted. With a root canal, you can enjoy a full smile longer. Dr. Mason has been delivering compassionate quality restorative dentistry to his patients in the Grapevine area since 1993. He and his team have the experience, skill, and technology to perform efficient and thorough root canal services with understanding and a gentle touch. Unlike most general dentistry offices, at Mason Dental – Cosmetic & Family Dentistry, we can even perform back molar root canals. If you are experiencing a chronic toothache and feel that you may need a root canal, call our Grapevine office today. Dr. Mason and his team serve patients all over Dallas-Fort Worth Metroplex, from Colleyville and Southlake to Keller.